In the early stages of her career, geotechnical engineer Susan Gourvenec, 44, began work in the pre-dawn hours – before London’s underground train system began operating – to study the stability of its oldest tunnels, which date back to the 1860s. The expertise she developed while deriving the geotechnical properties of the soil supporting the tunnels eventually transported her below the equator to the University of Western Australia’s (UWA) Centre for Offshore Foundation Systems (COFS) in Perth, which maintains the world’s highest concentration of geotechnical researchers. 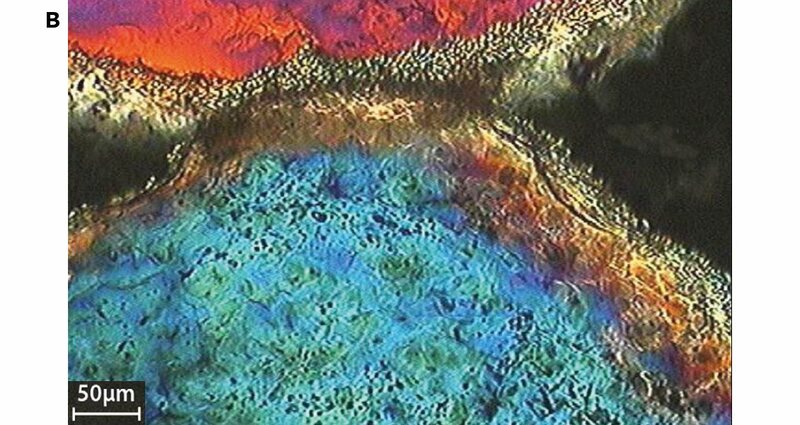 There, Gourvenec turned her focus toward the diverse and precarious nature of carbonate seabeds in an effort to help move the oil and gas industry forward. Offshore Geotechnical Engineering, Mark Randolph and Susan Gourvenec. To better understand the quirky nature of carbonates, Gourvenec is working in an ideal place, as carbonate deposits are highly prevalent off Australia’s north-west coast. At COFS, which is jointly funded by industry and government, Gourvenec works as a professor, researcher and author in offshore geotechnical engineering, focusing on foundation and pipeline solutions for offshore oil and gas developments. Australia’s seabeds have given her a foundation on which to thrive, as they present continual challenges and opportunities, which Gourvenec continually seizes and solves. She has become a rising star in the areas of education, research, industry engagement, scholarship and service. She is the co-author of the world-renowned book, Offshore Geotechnical Engineering, a developer of smart engineering solutions relevant to industry needs, and the creator and organiser of the popular International Symposia on Frontiers in Offshore Geotechnics (ISFOG) conference. Add to that list a fervent champion of programmes that encourage women to become scientists, and Gourvenec’s contributions to the industry seem near limitless. Gourvenec’s all-girls high school near London offered few opportunities for advanced mathematics classes, forcing her to study the subject at a local college before she could apply to the University of London to study civil engineering. “The academic who interviewed me for university entrance told me that it would require a lot of work to get through the first year of the engineering course,” she said. “I must have put up a convincing argument because they gave me a chance.” Gourvenec subsequently graduated top of her cohort. Susan Gourvenec is a professor at the Centre for Offshore Foundation Systems, University of Western Australia. Recognising her potential, a professor convinced Gourvenec to pursue a PhD in geotechnics, a specialisation of civil engineering, at Southampton University. Gourvenec dived into the unfamiliar research territory without hesitation and emerged successful. In the midst of her graduate studies, she was thrown another learning curve when she joined a team of environmental engineers mapping water flow and quality in a tributary to the Aral Sea in Kazakhstan. This temporary foray into hydraulics posed no problem for Gourvenec, who returned to Southampton to complete her doctoral degree on time. As a post-doctoral research fellow at Cambridge University between 1998 and 2000, Gourvenec was busy researching tunnels when she learned of the cutting-edge research taking place at COFS, which was founded in 1997 by geotechnical engineer, Professor Mark Randolph. Despite the fact that Gourvenec had never met Randolph, she sent him an e-mail enquiring about possible research opportunities. “She had worked with close colleagues of mine in the UK, so I was able to tap my network for their views of her,” Randolph says. “All positive!” So when a position became available in 2001, Gourvenec left for Perth with only a backpack. 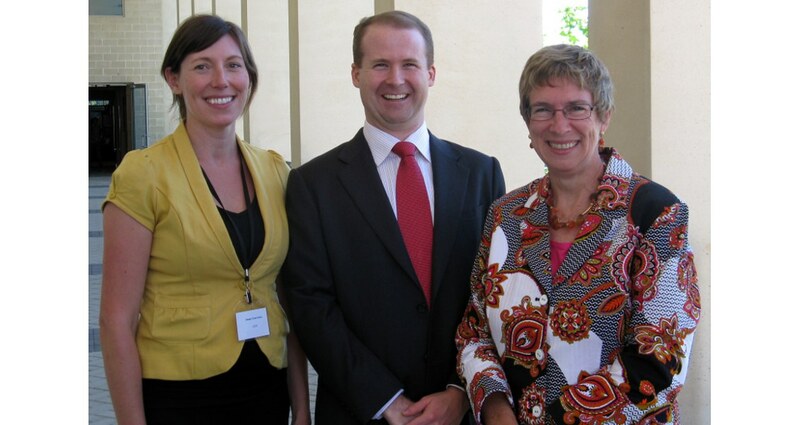 Susan (left), Mark Cassidy (now Director of COFS) and Anne Pickard, then, Shell Country Chair Australia and Executive Vice President Upstream Australia, at ISFOG II. Anne provided the opening address for the symposium. Perhaps even more mind-blowing was the boom that hit COFS around 2005. A number of emerging megaprojects around Australia prompted the need to better understand carbonate soils, particularly in previously untouched regions of the shelf and in deeper water on the continental slope, to develop smart engineering solutions. Carbonate deposits cover roughly 35% of the ocean’s seabeds, so the expertise developed in Australia can be applied to other regions with carbonate seabeds including Brazil, India and the frontiers of East Africa and the South China Sea. 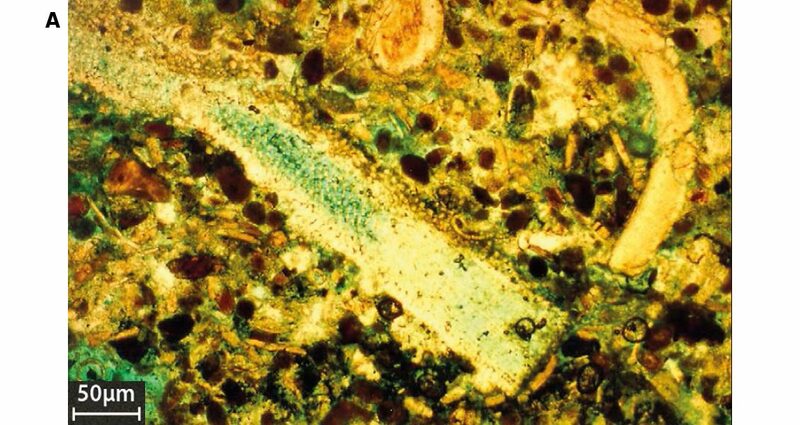 Carbonate seabed deposits are essentially the skeletal remains of marine plant and animal life, which contain calcium carbonate. The fragility of the calcium carbonate coupled with the deposits’ highly variable grain shapes and sizes can lead to high but easily degraded frictional strength and high compressibility, as Gourvenec explains. These characteristics can adversely affect driven pile capacity or the shaft capacity of dynamically embedded anchors, as well as lead to large degrees of settlement under mat foundations. 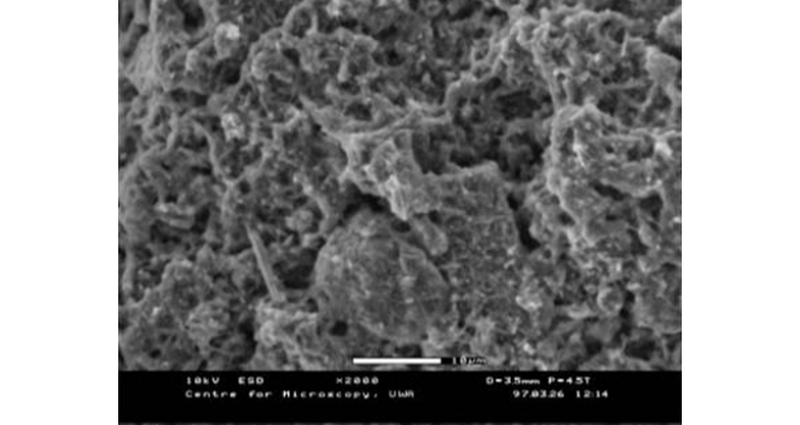 Microphotos of cemented carbonate deposits from the North West Shelf of Australia; (A) calcarenite, (B & C) cement fringes around carbonate sand particles. An expanding knowledge of carbonate seabeds and the development of engineering tools for the design of safe infrastructure are allowing Gourvenec and her colleagues to assist the industry in unprecedented ways. Their research has contributed to the development of complex ROV systems that can take soil samples in deep water. They have established new sensors, tools, and engineering design methods that advance site investigation and seabed surveys, as well as improved assessment of geohazards, such as seabed slides. They also have developed more detailed measurements of soil response to varying loads, using seabed penetrometers developed by Randolph and his colleagues; devised new methodologies to efficiently optimise the design of shallow ‘mat’ foundations; and researched innovative anchoring systems to better secure fixed platforms and FPSO vessels while simultaneously reducing production costs. 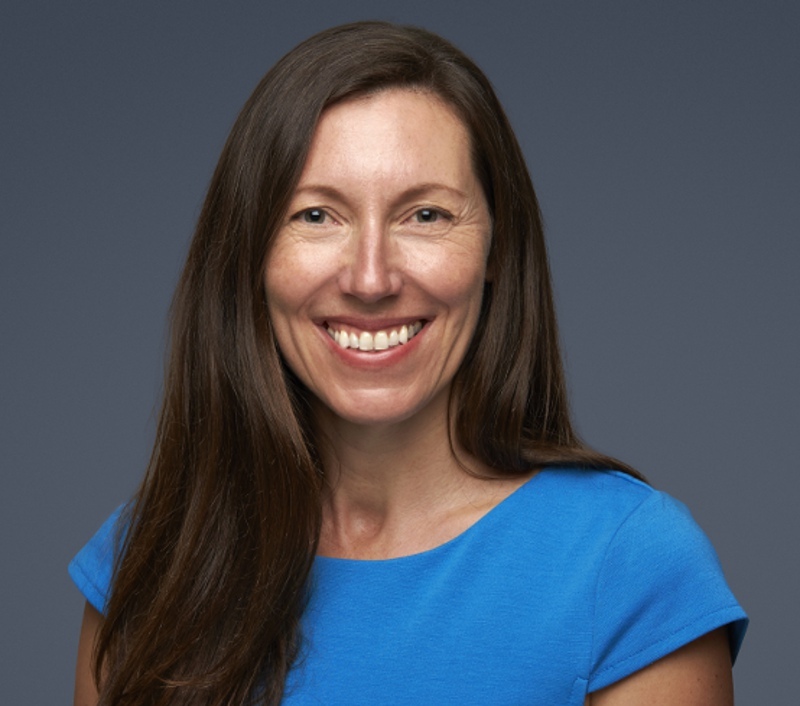 “Susie has led the work on analysis and design of shallow foundations – now ubiquitous within the industry for the various applications associated with subsea systems,” Randolph says. “She has developed design approaches of increasing sophistication and value. Central to this has been the use of failure envelopes to quantify the interaction between different modes of loading. Failure envelopes represent a significant advance in industry design guidelines, as they provide a more accurate method of sizing foundations to accommodate the many complex loading events they may see during their operating life,” Randolph explains. “Susie’s work has been eagerly adopted by an industry keen to unlock the cost and reliability benefits, and it now features extensively in design guidelines and codes of practice as an alternative approach to older methods,” he adds. 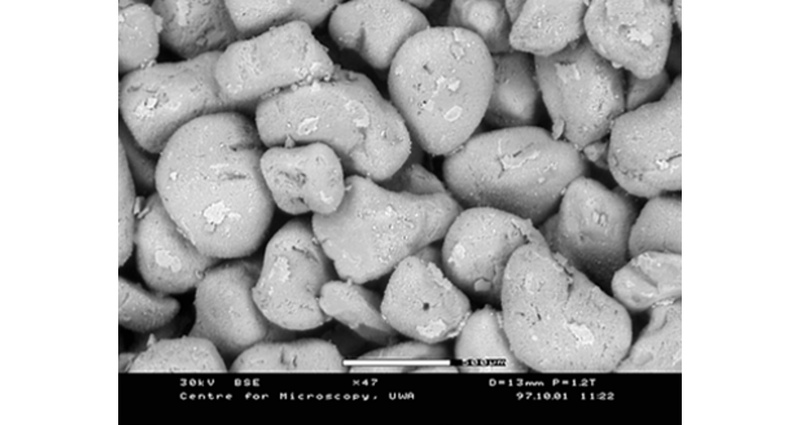 Scanning Electron Microscope micrograph of silica sand. 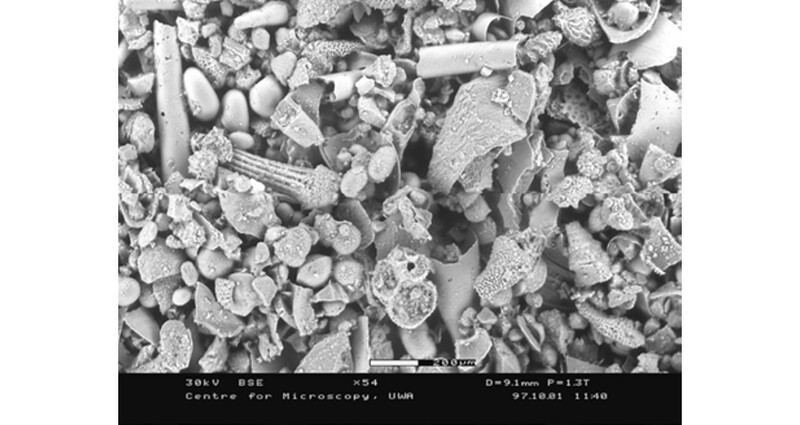 Scanning Electron Microscope micrograph of carbonate sand. 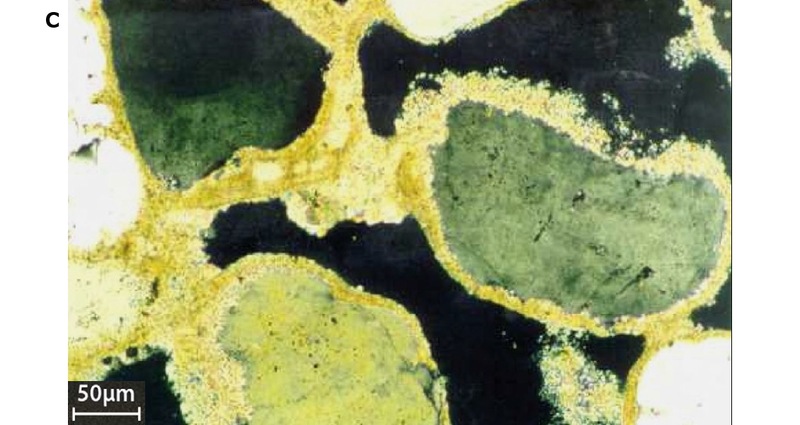 Scanning Electron Microscope micrograph of carbonate silt. While most achievements are not made alone, Gourvenec’s individual contributions to her field have not gone unnoticed. As a research leader, Gourvenec supervises, trains and mentors a team of early career researchers, PhD students, honours students and visiting scholars. “In the Australian vernacular, I try to ‘give everyone a fair go’ because sometimes you cannot tell what people are capable of or what they will bring to a team. Not everything that matters can be measured with a KPI [key performance indicator],” she explains. Also charged with duties of industry engagement, Gourvenec promotes and leads joint industry projects, and serves as an elected member for committees of the global International Organisation for Standardisation and the American Petroleum Institute. Not only is her research applied widely in the industry and referenced in international guidelines, she is a regular commentator on platforms such as the popular news website, The Conversation. Gourvenec has published more than 80 peer-reviewed technical journal and conference papers, two edited proceedings of international symposia, and one state-of-the-art textbook with Randolph as the co-author. 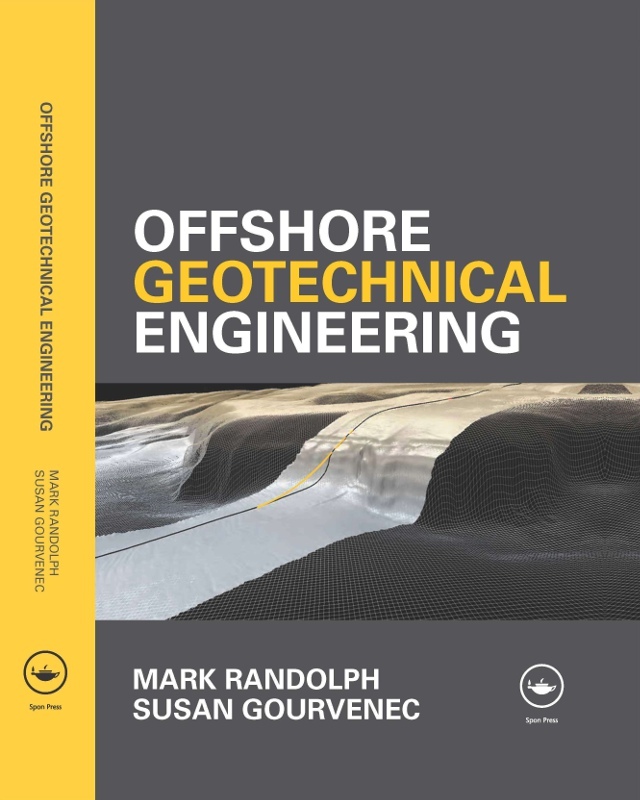 Offshore Geotechnical Engineering, published in 2011, has received positive feedback from academicians and industry personnel from around the world. “I often spot it on desks and bookshelves when I go to meetings locally and internationally. It will shortly be republished in Chinese due to demand,” Gourvenec adds. She has earned awards from the International Society of Soil Mechanics and Geotechnical Engineering, the Australian and New Zealand Geomechanics Society, the Institution of Civil Engineers in the UK, the American Society of Civil Engineers, the Canadian Geotechnical Society, and within UWA through the Vice Chancellor’s Research Excellence Awards. Of all of Gourvenec’s accomplishments, she seems most proud to have secured a respected place in the oil and gas industry – period. That part sweetly made its way into one of the ISFOG symposia in Perth. Chaired by Gourvenec, the inaugural event in 2005 welcomed 182 academicians and industry practitioners representing 22 countries. 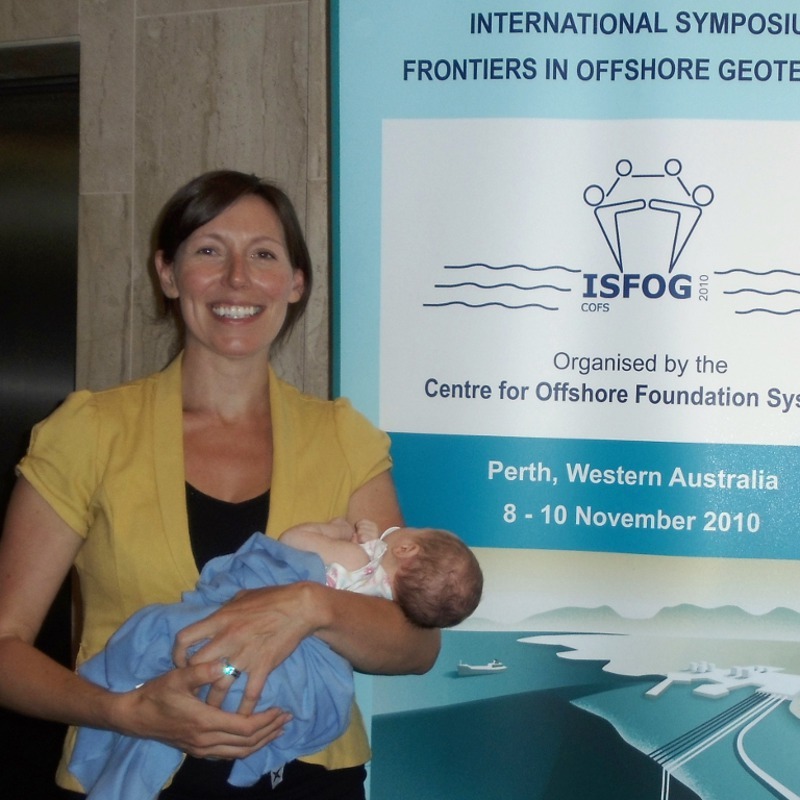 The second event, held in 2010, saw a growth in participants with 306 delegates from 24 countries – plus one very special guest, Gourvenec’s five-week-old daughter and perhaps budding scientist, Helen. Randolph M. and Gourvenec S. (2011) Offshore geotechnical engineering, Spon Press, N.Y., 550pp.